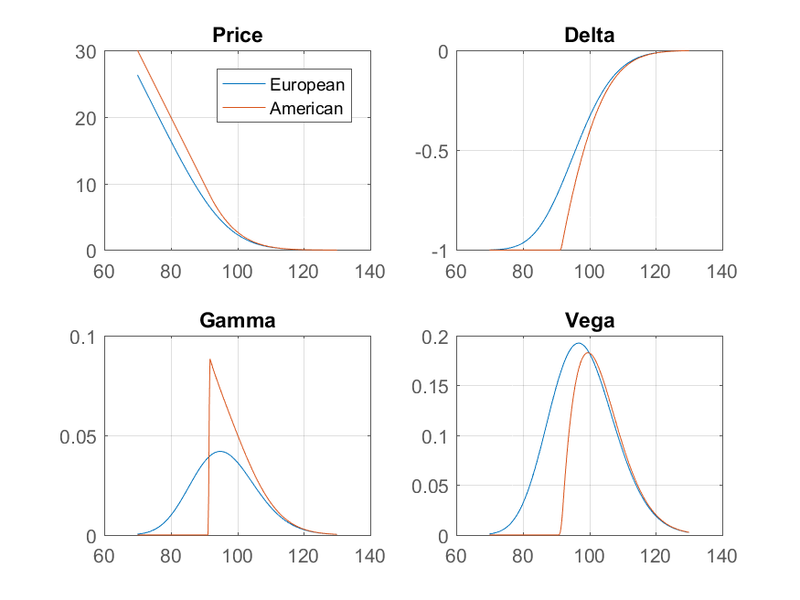 Considering an American option in a Black-Scholes model, is there a relation between Vega and Gamma as it holds in the European case? I am aware an exact relation would be difficult to find. But in practice is there a kind of approximate relation between these two quantities? No, you should not expect such a relationship to hold in general. The reason is that American options have an "exercise barrier" which European options don't, and this results in different prices and greeks. In the case of put options (with interest rate $r>0$) as the spot price falls, at some point it becomes optimal to exercise early and take the cash. Beyond this point, the option behaves like a short position in the stock, so its delta is exactly -1 and its gamma is zero. As the spot crosses through this barrier, the gamma jumps. 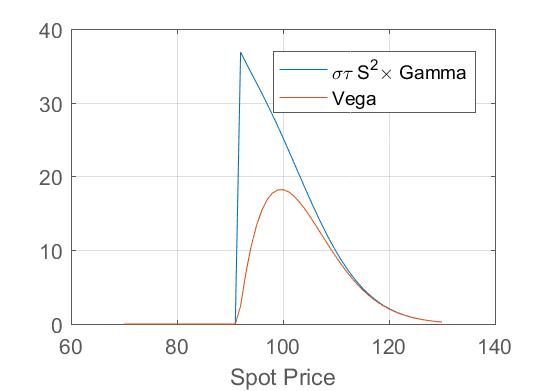 Vega, on the other hand, does not have such a discontinuity. The chart below shows the price of a European and American put with strike 100, three months to maturity, risk-free rate 15% and volatility 20%. The European prices and greeks are from the Black-Scholes model, and the American prices and greeks are from a binomial tree. will approximately hold. The plot below shows how this relationship holds when the spot price is sufficiently far above the strike, but breaks down when it approaches the early exercise barrier. Not the answer you're looking for? Browse other questions tagged greeks american-options gamma vega or ask your own question.